The depth chart released Friday shows that the starting five on the offensive line will consist of a senior, a junior, a sophomore and two freshmen. Provo • Lost in last Friday’s release of BYU’s 2018 depth chart that showed senior Tanner Mangum will start at quarterback in the Cougars’ season opener Saturday against Arizona was the naming of the team’s starting offensive line. It was almost as much of a mystery as the starting quarterback situation. But it is quite likely just as important, because the offensive line’s performance will go a long way in determining if Mangum is as effective as he was in 2015 or struggles as much as he did in 2017. The “tip of the spear,” as offensive coordinator Jeff Grimes calls it, will include senior Austin Hoyt, junior Thomas Shoaf, sophomore Tristen Hoge, and a pair of Utah high school products, freshmen James Empey and Brady Christensen. Actually, American Fork’s Empey is listed as the co-starter at center with junior Jacob Jimenez, who sat out all of last year with a knee injury, but the son of former BYU offensive line coach Mike Empey received the majority of the first-team reps the last week of preseason camp. Whoever emerges will try to fill the shoes of four-year starting center Tejan Koroma. “That position is vital to the success of the entire offensive line,” head coach Kalani Sitake said. The other freshman, Bountiful’s Christensen, will be tasked with protecting Mangum’s blind side. Are these guys capable of creating the type of protection Mangum or backup Zach Wilson will need while also making running lanes for senior Squally Canada and freshman Lopini Katoa? “I like the way they’ve looked so far,” Sitake said. He was talking about the way the unit plays in practices and scrimmages, but he could also have been referring to their actual appearance. Returning starters Shoaf and Hoyt have added some “good weight” to get to 300 pounds or more, and Empey, who returned from his church mission weighing 250 pounds, is up to 290. 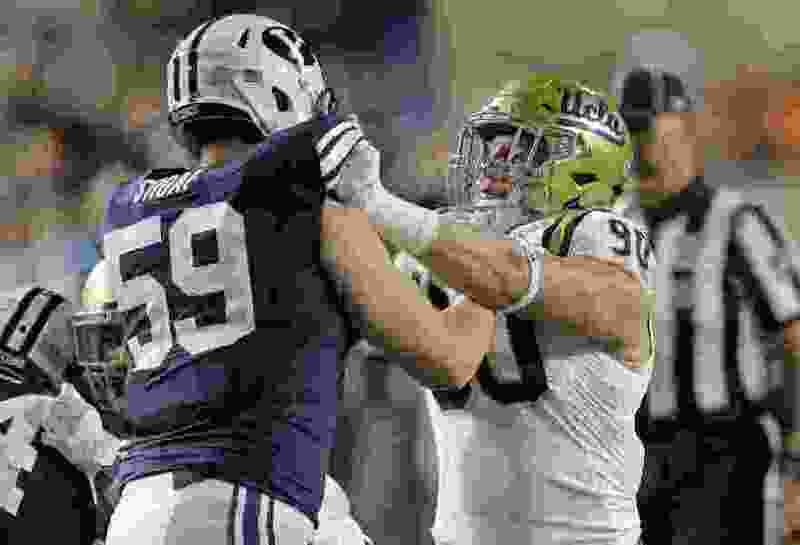 Christensen is listed at 295 and Hoge, the top-100 recruit from Idaho who sat out last season after transferring from Notre Dame, is a solid 305. The backups as of now are senior Ului Lapuaho, redshirt sophomores Kieffer Longson and Chandon Herring and freshmen Keanu Saleapaga and Harris LaChance. Saleapaga basically switched places with Austin Chambers, who is now playing defense. Lapuaho is making a comeback after wrecking his knee nearly two years ago at Utah. Sitake has raved all spring and summer about the way Grimes and his hand-picked offensive line coach, Ryan Pugh, have developed an offensive line that was OK but hardly dominant in 2017. Hoge agreed. Pugh, who was a four-year letter-winner and the center on Auburn’s national championship team in 2010, was the offensive line coach at UT San Antonio the past two seasons.